I’ve been hunting out of tree stands before anyone ever thought of manufacturing and selling them to the hunting public. I used to make some great ladder stands made from 2×4’s for about twenty five dollars. Now a good ladder stand could run upwards to $300.00 dollars. These new tree stands are great (if you can afford them) and come with a harness and instructions on how to use it. Several years ago a friend of mine fell out of his stand, and spent a week at U of M hospital with a bruised heart. He now uses his harness. I know another local hunter who broke his arm, and we’ve all read the stories of the guys that have paid the ultimate price for not wearing a harness. This year when you guys and gals go into the field to hunt, and you plane on hunting from a tree stand, do you and your family a favor. Wear that harness! It could be the best decision you’ll ever make as a hunter. 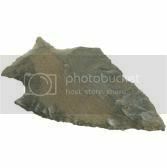 I was just going through my collection of indian arrowheads and the thought struck me “How did they ever bring down elk, bear, and buffalo with such primative equiptment?” Not just the stone arrow, but a shaft whittled right off the tree. The string was woven horse hairs, and the bow itself was a tree limb! If the Indians had the equiptment we have now they might still own part of this country. You have to give them credit for being the ultimate hunters. You don’t survive for thousands of years without food on the table. The tactics and hunting skills required to bring down such huge food sources boggles the mind. Now is the time to start filling the freezer with whatever you can get your hands on for bear baiting.� We used to have access to a walk-in cooler which was ideal for storing tons of bear bait.� Thats right I said tons.� If you plan on baiting more than 3-4 sites you’ll need every bit of 2-3 thousands pounds of bait.� There have been years when we’ve used 5-6 thousand pounds when all is said and done. If you know a butcher and can get and freeze meat scraps thats great.� Also pastries from donut shops and wholesale bakery outlets is a must.� There is a fish market near Marquette where we hunt, and during bear season they freeze 100 pound boxes of suckers and fish scraps.� If you get in a pinch dog food with a little syrup poured over it will work.� Grease of any kind, and bacon grease in particular, is good.� Candy and any sort of sweet toppings are great.� Marshmellows seem to work wonders whenever we have used them.� One year we were fortunate enough to get to use the carcass of a cow.� Besides all of the things mentioned there are several individuals and companies that sell bear bait.� Once you have a bait “hit”, keep it chucked up and hot or that bear will leave and find another “live” bait. The Ansel brothers have hunted the rolling hills of Marquette Michigan since 1973.� That’s 34 years of knowledge under our collective belts.� We started with rifles and switched over to bows many years ago.� Even our sons use archery equiptment when they get a permit.� I say all that just to let you (the reader) know if you have any questions concerning bear hunting I have a pretty good “well” to draw from. The advice I’d like to leave you with in this blog is don’t shoot the first bear you see if you are not sure it’s a mature boar or a non lactating sow.� That first bear you see in the wild can look like a “monster”, but actually be a yearling (80 pounds! )� Be patient!� The best way to judge the size of the bear is to wait for multiple bear to be within sight.� I realize that doesn’t always happen, so you need to look for the signs of a mature bear.� A big bear will have a blocky/stocky look, and his head will be broad with a short looking snout.� Younger bear will have more of a sleek longer look, with a narrow head and longer looking nose.� A sow with cubs is a no-no, so please don’t make that mistake.� Usually a female will let the cubs come into the bait site first, so thats a dead give away, but sometimes she will venture in first.� You must be patient! I’ve hunted bear in Quebec a couple times where the outfitter used 55 gallon drums for his bait.� He told me if the bears back stood as tall as the barrel, it was a shooter.� It’s illegal to use non biodegradable material at your bait sight in Michigan, so a 55 gallon drum is “out.”� If there is a stump close by, or a low hanging limb, you may be able to use that to judge the bears size. Remember it is a privilege to bear hunt, and it could be a “once in a lifetime” experience for you, so make it a good experience.� Don’t make the 150 pound mistake-be patient. The drawing results for those fortunate enough to draw a coveted Michigan bear tag came out last week. Of course my brother Darryl was drawn as usual. The man has some kind of a system he uses, cause he seems to get a permit on a regular basis. Maybe he’ll allow me to film for him this year, as I missed the permit deadline. I sure miss the good old days when you could buy a permit over-the-counter. Anti hunters are the ones to thank for that! You bear hunters that didn’t draw a permit have another option. Try a Canadian bear hunt. I’ve hunted there four times, and had only one bad experience. Twice I went with Dale Hayford to Quebec. Dale books bear hunts and fishing trips through Hayfords Hunting Adventures, and Serge (the bear camp owner) runs a great outfit. Several hunters from Monroe, and the surrounding area, have taken nice bear on this hunt. You won’t have to re-mortgage your house with Dale, and the fishing is also top notch. Of course there are several good outfitters in Ontario, but an outfitter will charge close to $2000.00 for a first class hunt. If there is anyone reading this blog that would be interested in a Canadian bear hunt, Texas deer hunt, or an out west elk hunt drop me a note on my blog. Good hunting partners are hard to find! If you’ve got one you are blessed. “What’s going on I asked my son?”� “Just listen Dad” he whispered.� Then my deaf ears picked up the faint “yip-yip-yip-ooow” from a woods to the east of us.� Within seconds a second group of coyotes to the west started chiming in.� It was pretty neat listning to the “Call of the Wild” right there in my own back yard.� The local farmers chickens, ducks, and geese might not of thought it was so cool, but it added a real outdoor backyard “boonie” experience to the evening. Twenty five or thirty years ago a coyote in Monroe was a rare sight, but now it is quite commonplace.� Weather this is good or bad I can’t say, but to know there are several packs of “little wolves” running around my neck of the woods, makes me feel kind of “wild” in my own backyard! This evening I had Pastor Joe and (RuthAnn) Atkinsons 4 grandchildren over for some fundamental lessons on shooting a bow and arrow. About 10 years ago I did this with 5 other grandkids of theirs, and it evidently was successful, as they still fondly remember our time together. Most kids usually do not have anyone around to show them the basics of archery unless they go to a summer camp. I try to show them what fun they can have if they master a few simple techniques. I think this years group of kids did just great with Joy, Katie, Seth, and Eric showing some real promise as young archers. After shooting the bow we headed for the family room in the basement for a game of “name that animal.” It was close, but Joy was able to name most every critter hiding down there. They really seemed to enjoy themselves, and I always do to. I doubt if any of them will grow up to be hunters, but at least maybe they will not be “anti-hunters.” Hopefully I was able to plant a seed that the hunting community can one day harvest. We truly need friends among the non-hunting population if our sport is to survive into the next decade and beyond. I�spent fathers day in Chicago with one of my daughters (Meghan,Mark, & Login) painting and attempting to put together a playset.� This 4 hour job is turning into a 12 hour nightmare.� All my children have called, or sent cards wishing me a happy fathers day.� I appreciate and love each one of them very much. Any way its been 29 years since my own dad was here for fathers day, and he’s missed just as much as ever.� My dad had 6 boys and he spent as much time with us as he possibly could.� Sometimes he worked two jobs to keep a roof over our heads, but he seemed to always squeeze us boys in his schedule.� He taught us the finer things in life like hunting, fishing, trapping, baseball, and camping.� What great memories I have of my dad and our times together as father and son.� I am a 60 year old man who knows beyond a shadow of a doubt that he had a father who loved him.� Its sad to say, but not every son can say that of their father.� The memories you left me dad grow more precious every year.� Thanks for loving us all.� Happy fathers day. We were on our way to see my daughter Meghan and her husband Mark, and of course�our grandson Logon who live in the northern Chicago suburbs of Deerfield.� Mark is not a hunter, but during our ride from the train terminal he showed me areas where he would see deer most everyday.�These are areas that you are not allowed to hunt in and you wouldn’t expect to see herds of whitetail running around.� They are adaptable animals to say the least, and�thanks to hunters, and sportsmen in general, their numbers are higher than anytime in the history of this nation.